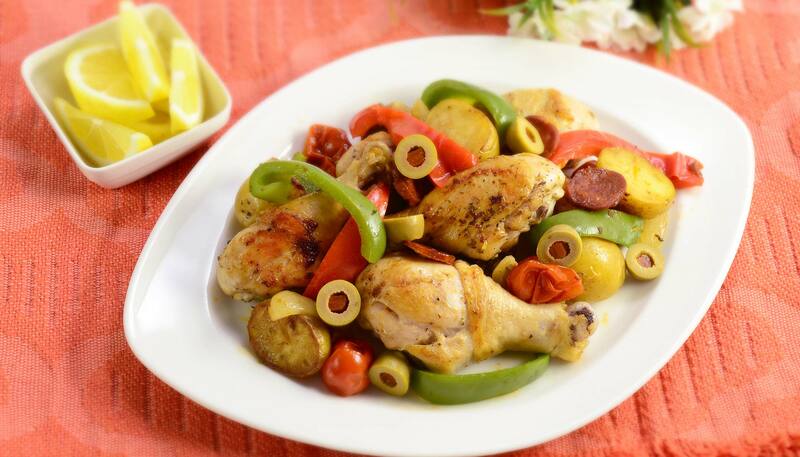 Tender drumsticks and veggies are sauteed with chorizo, garlic, wine and paprika powder. The smokey flavor of paprika makes this a flavorful dish. It is a hassle-free recipe that is also perfect to make for a get-together! 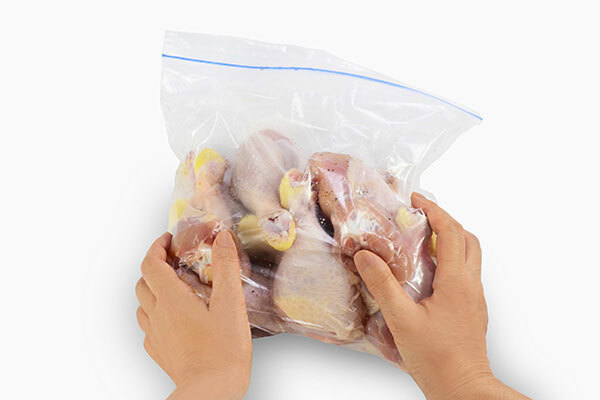 Place drumsticks in a plastic bag, add sugar and rub in to keep meat tender. 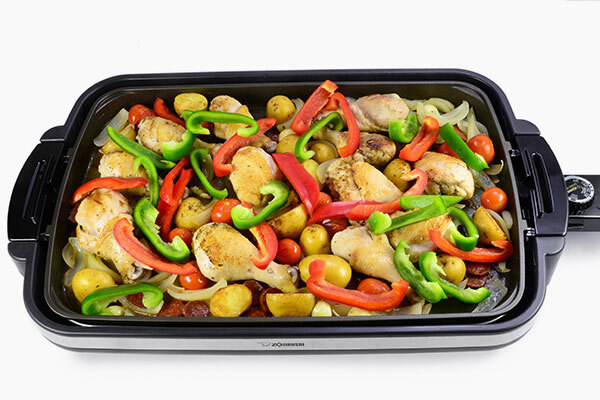 Then season with salt and black pepper and marinate in the refrigerator for at least 30 minutes or overnight. Pat dry before grilling. 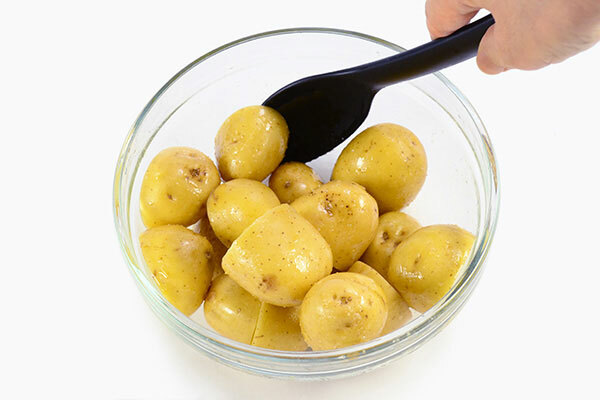 Cut baby potatoes into bite-sized pieces and place in a bowl. Add olive oil, salt and mix to coat. 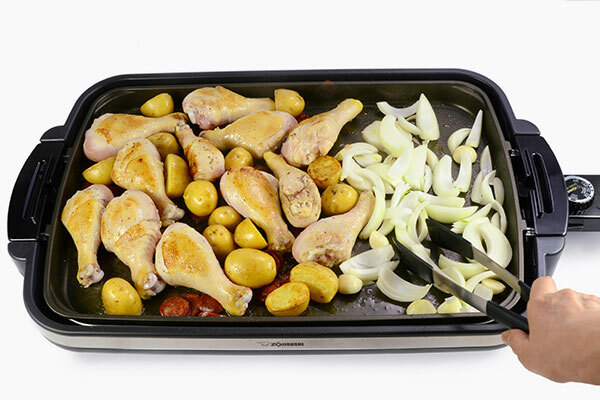 Set the Gourmet Sizzler® Electric Griddle (EA-DCC10) to 400ºF. When the pilot lamp turns off, spread olive oil. 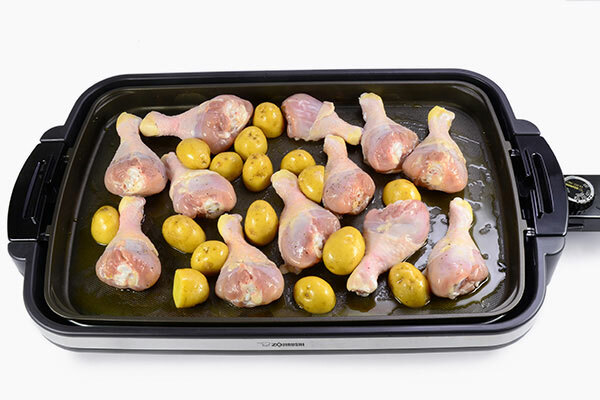 Place drumsticks and baby potatoes and grill for 5-6 minutes or until the drumsticks are golden brown. Be careful of the oil splattering while grilling. Pat dry the drumsticks before grilling to reduce splatter. 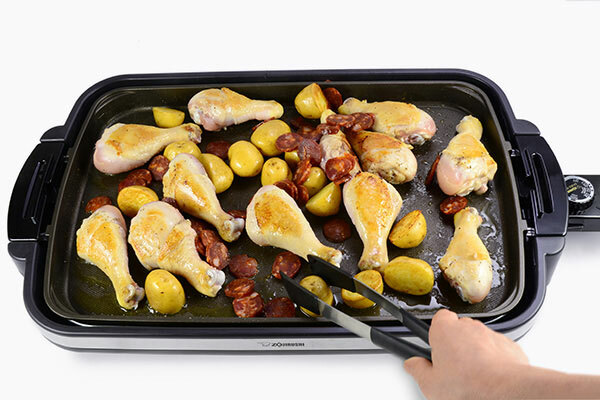 Flip drumsticks and potatoes, then reduce temperature to 300ºF. Add chorizo slices and grill both sides for 2-3 minutes. Make room at the side of the griddle. Add onion and garlic, and sauté for one minute. 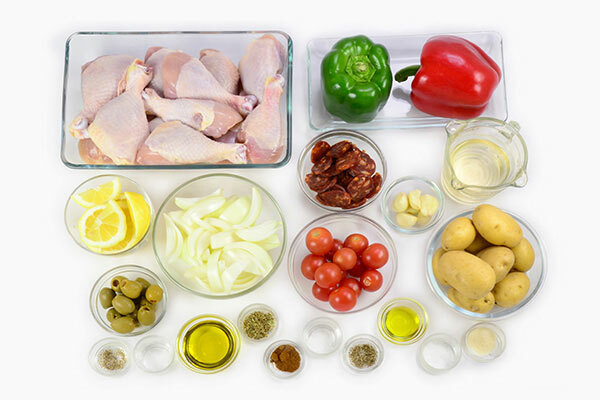 Add cherry tomatoes, wine, paprika powder, oregano, and mix to combine all ingredients. 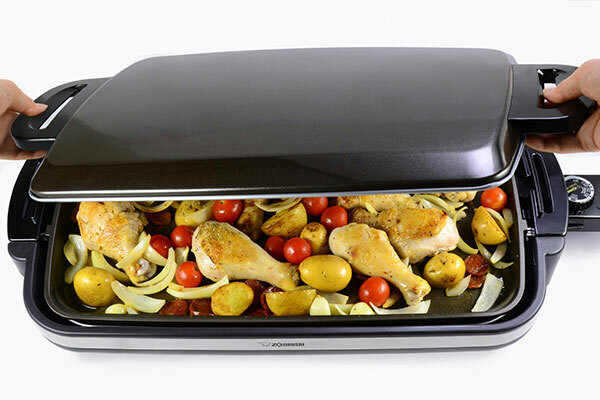 Cover with lid and cook for 10 minutes. Cut bell peppers into 1/2 inch wide strips. Add to the griddle, cover with lid, and cook for another 5 minutes. Remove the lid and cook for 3 minutes or until all liquid evaporate. Add salt and pepper if necessary. 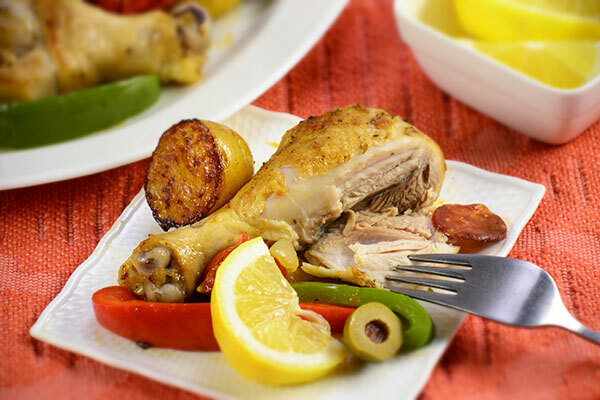 Turn heat off and transfer drumsticks and vegetables to a serving plate. 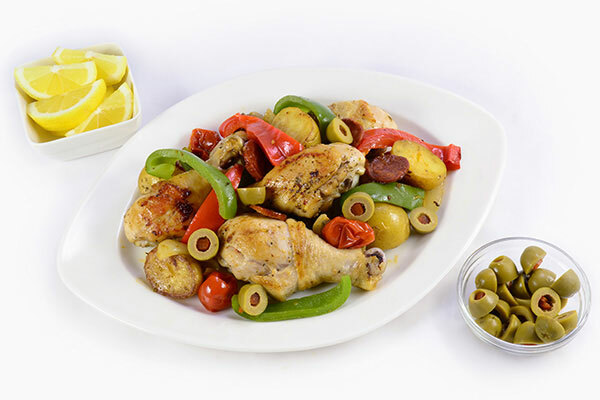 Top with olives and lemon wedges.